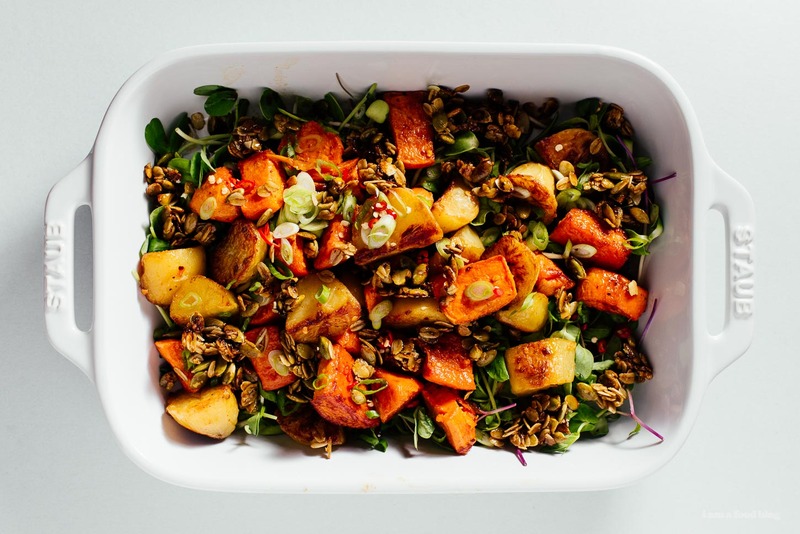 Crispy roasted potatoes and sweet potatoes in a lime soy dressing, with greens and a savory pepita-pistachio granola. We’ve been on the road for a while now and while we have been eating food that we make at camp, I miss being in the kitchen. I made this little potato salad situation right before we left and I’m wishing I could make it right now, but it might be just a touch ambitious for camp cooking. Have you guys been reading our posts on our Canada trip? I can’t believe how far we’ve gone – we’ve only posted on Banff, but have a bunch of posts lined up. We’re just starting to break up our camping with some serious city life. Right now we’re in Winnipeg and I’m happy to say that we’ve been eating up a storm. We hit up a cute little place in The Exchange, Deer and Almond, and enjoyed it so much that we contemplated going back. But, it appears that the Peg (what locals call it?) is full of cute and tasty places, so it’s on to more deliciousness. I’m way excited to eat my way through the rest of Canada, so if you have any recommendations, anywhere, please send them our way! Speaking of being excited to eat things, this potato salad is amazing. 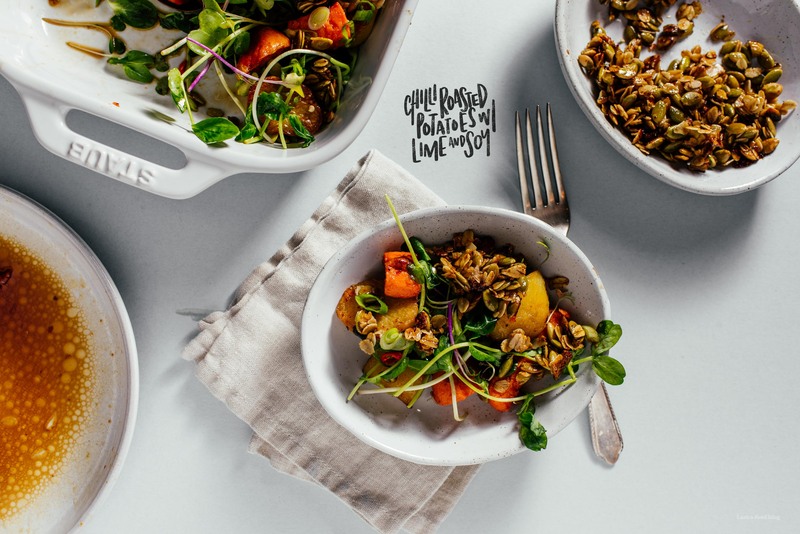 I love the crispy roasted vegetables, the crunchy savory honey soy granola, and the chili lime dressing. 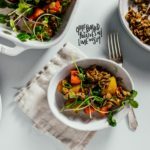 I’m really into textural and temperature differences and this salad has it all: hot roasted potatoes, cold greens, crunchy granola, and soft and tender sweet potatoes. The recipe comes from Izy’s (Top With Cinnamon) newest book, The Savvy Cook. It’s the perfect book when you’re cooking for yourself, or for two. I love how she aims for maximum flavor for minimum effort and how there’s a section at the back of the book for leftover ingredients that you can use in other recipes. 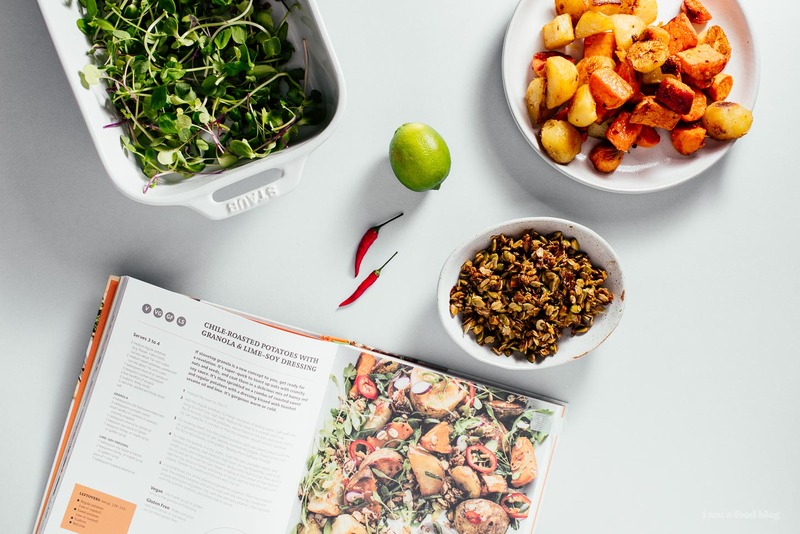 It’s clever, clean, and oh so gorgeous – just the way you want to be cooking and eating. My potatoes and sweet potatoes were small and cute so I went with 4 of each. I also substituted the called for peanuts/cashews with pistachios. Ditto for the arugula, I used microgreens, which undoubtably contained some arugula shoots. Add the potatoes to a large saucepan of boiling water. Salt well then bring back to a boil over high heat. Reduce and simmer for 5 minutes. Drain, return to the pan and cover for 5 minutes so the potatoes steam a bit. 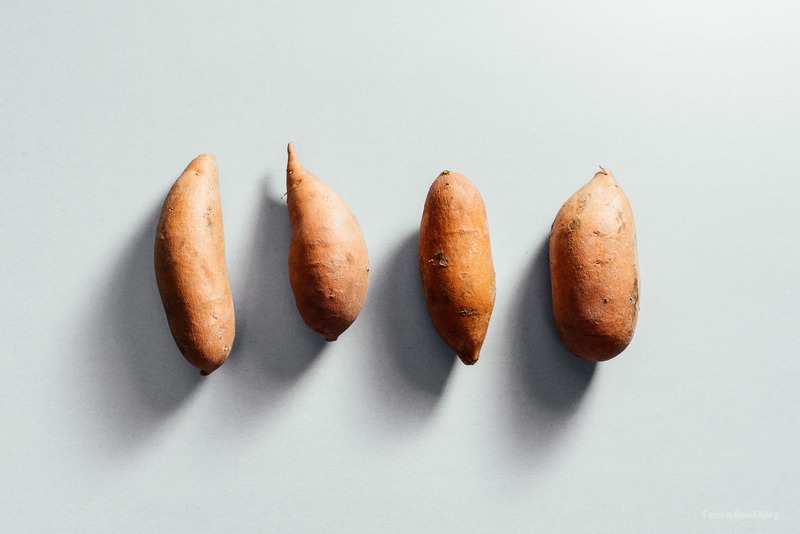 On a baking sheet, toss the cooked potatoes and raw sweet potatoes with the oil, a generous amount of salt, and the crushed red pepper. Roast for 50-60 minutes, flipping halfway through. 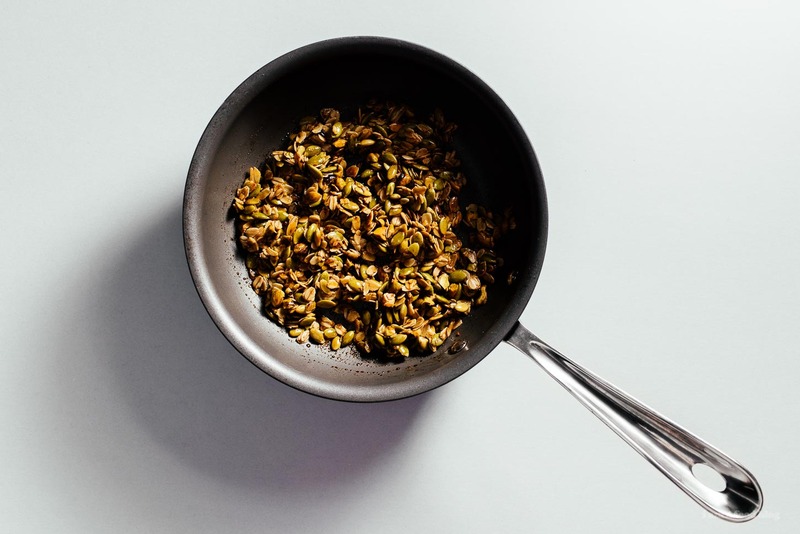 Make the granola: in a dry skillet, toast the oats, pumpkin seeds, and pistachios over medium-high heat, stirring frequently, until nutty and starts to brown. Reduce heat to low and stir in the oil to coat everything. Make a hollow in the center of the mix and add the soy sauce and honey. Stir until well coated. Transfer to a plate and let cool and crisp. In a small bowl, mix the dressing ingredients together. Pour the dressing over the roasted potatoes and toss to coat. 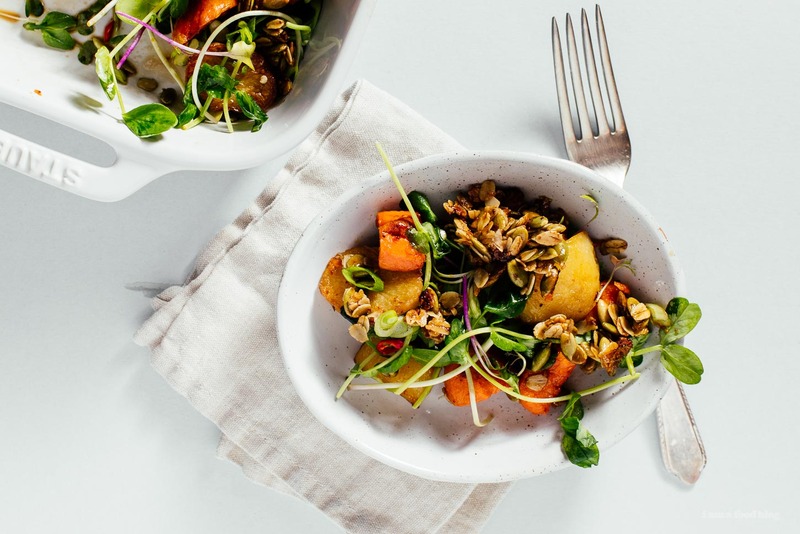 Make a bed of microgreens and top with the dressed potatoes. Sprinkle with granola and green onions. Enjoy! Yes to all the texture in food!! I think I need to make this to serve with the pork ribs we are smoking on Sunday. Something a little different to our usual whole baked potato. This looks so tasty! I love salads. I’ve never put potatoes in my salad. Will give this a try soon.